Can you make sense of the ''credit card merchant statement" above? Neither can most small business owners, who get documents like this every month. NEW YORK (CNNMoney) -- Many small business owners are befuddled by complex financial statements. And it could be costing them. Each month, small business owners receive invoices from financial companies detailing their companies' credit and debit card transactions. Few owners, however, have the time or inclination to make sense of the documents, which can be pages long with columns of teeny tiny numbers. The problem? Some of those numbers could be higher fees or additional charges that can escape even the most eagle-eyed of owners. Businesses that accept credit and debit cards as a form of payment have to pay fees for each transaction. Mom and pop stores do not deal directly with credit card giants, such as Visa (V, Fortune 500) and Mastercard (MA, Fortune 500). Instead, they have to work with third-party processors -- known as merchant account providers or acquirers. Third-party processors often provide merchants with payment terminals -- the machines where customers "swipe" their credit or debit cards. Their pitch to business owners is: "We will give you this for free, and we will take a tiny cut of every dollar," explained Tim Chen, CEO of NerdWallet, a credit card information site. The third-party processors then send the small business owners monthly invoices detailing their transactions. These documents are so complicated that many small business owners can't make heads or tails out of the charges. And many of them don't have time to figure it out. "We are business owners. We are working. We are taking care of the customers,'' said Mike Craighill, who owns two restaurants called Soup and Such in Billings, Mont., with his wife, Antonia. "I don't have time to spend looking over every single line of the credit card statement." Craighill gets a monthly statement that runs between seven and 10 pages long for each store. Even if small business owners took the time to look at these statements, few would be able to understand them, experts said. "This is a very confusing industry for merchants," said Phil Hinke, founder and president of MerchantFeeSavers, a company that helps small business owners understand the numbers. And making sense of all those charges is no easy task. First of all, the credit card merchant statements of each processor look different. And to make matters worse, every credit card has a different fee structure. Every credit card brand -- such as Standard MasterCard, Gold MasterCard, Premium MasterCard, World Elite MasterCard -- has its own fee structure. That means there are at least 400 different combinations of charges. The complexity of these statements makes it easy for third-party processors to inflate or tack on extra fees, said Hinke. "There are probably a lot of things that are getting missed," said Craighill. And then there is some information that's just missing. 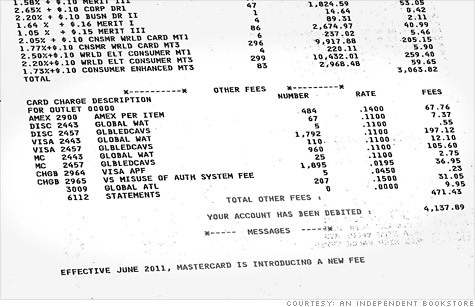 For example, the bottom of the statement shown above, says: "Effective June 2011, MasterCard is introducing a new fee." What it doesn't say is what the fee is for or how much it is. Hinke said these processors may take minor fees from credit card giants and pass them along to retailers at much bigger charges. In some cases, these statements are confusing, because the processors are trying to be transparent and break down every single fee, he added. And then there are those processors who "purposely provide confusing or ambiguous statements," said Hinke. The processors, he said, are being "clever." Confusion is in the eye of the beholder, said Greg Frumin, CEO of the North American Credit Card Association, a Greenwich, Conn., company that works for some of the nation's largest processors. A cupcake baker just does not understand credit card fees the way an accountant does. And in a complicated industry, the confusion can be because the merchant just doesn't understand, he said. Merchants can opt for processing contracts that are much simpler, with fewer tiers of charges, he explained. What they gain in simplicity, they may lose in profits. The more precise statements are going to be more confusing for the merchant, said Frumin. That's why for some business owners, cash only may be the best way to go. Banks' wrath: High ATM fees! 30% APRs! Vanishing rewards!